Foto-booth will spice up my wedding reception! Filipinos love Cory Aquino so much! I got my amended passport back! 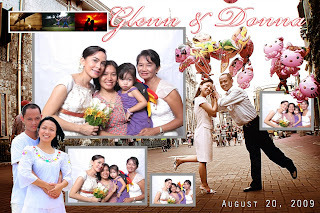 Basically, Foto-booth is a mobile photo booth rental for birthdays, debuts, weddings, corporate events and children parties. I have first read about it several months before I even seriously started my wedding preparation. I saw a couple from Manila used it on their reception and I was interested to have it on my wedding as well. Unfortunately, I've learned at that time that there's no vendor yet in Cebu. But a few weeks ago I found out about Foto-booth. 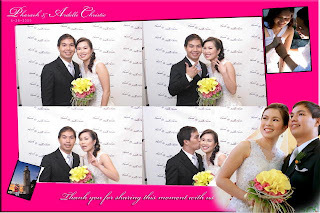 It is the FIRST mobile photo rental in Cebu and I was so glad I found them while I was doing my search for my wedding. I didn't think twice, I contacted them right away and they are so prompt with their responses. I have booked them last week and I'm pretty sure my guests will enjoy having unlimited photos taken for free as a souvenir. All photos will be printed in 4" x 6" format in a customized layout pre-chosen by me. After 24-36 hours, all photos taken during the event will be posted on the vendor's multiply website. 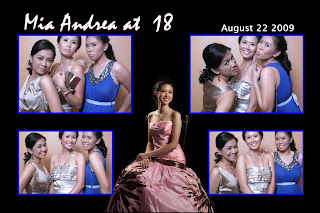 Below are some Foto-booth samples taken at weddings and debut. Franz Arrogante will cover the important moments of our wedding through videos. There will be 2 cameras shoot for the entire wedding day and everything will be covered from the dress-up in Marriott, to the church ceremony and down to the reception in Casino Espanol. A 3-5 minute video highlights of the wedding will be shown at the reception in an MTV style. Two DVD with 20-25 minutes final output as well as a copy of the raw footage will be provided to us. They say the wedding only lasts for a few hours but after that, all you have are the memories captured through photos and videos, so I made sure both will be taken care of by one of the best professionals in town. We're getting closer to the big day!!! I can't believe that it's already been a week since I last updated my blog. I don't usually wait this long to write some updates but things have been going pretty hectic lately. After work, most of my time and energy had been spent researching for wedding suppliers. It's not easy planning your wedding when you're thousand miles away from everything. Good thing there's internet, it's really been such a helpful tool for me. For the past week, I have been busy taking care of important stuff. I've sent out our church requirements through UPS. I have been waiting for the bridal shop to call me about my wedding dress, they said it should be delivered within this week. The waiting is killing me, lol! I really have to have it as soon as possible so as to take care of the alterations immediately. After spending quite some time looking for people to complete my wedding dream team, I have finalized my florist, make-up, video and wedding planner choices. Hopefully, my mom would be able to meet them all within this week for the contract signing, that way I can feature each of them here on my blog. 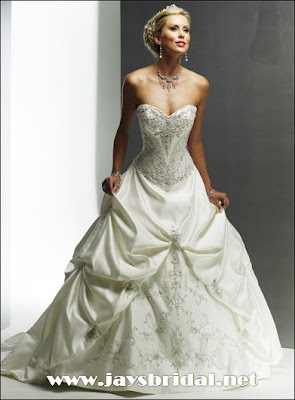 ...is a Monalisa Royale by Maggie Sottero. It has always been a dream of mine to walk down the aisle and feel like a princess. When I first laid my eyes on this gown through the designer's website, I knew right then and there that this is the dress I'm going to wear on my wedding in the Philippines. We went dress shopping for 2 days. The first bridal shop that we went to does not carry Maggie Sottero's designs but I still went ahead and try something that looks a little bit similar. It was pretty, but I would still want to find a place that carry the Monalisa Royale. The last 2 shops that we visited are authorized dealers of Maggie Sottero and I was ecstatic that they had the exact dress that I wanted to try on. Just as what I've thought, the dress was gorgeous. Hubby went with me but I stayed the whole time in the dressing room, that way he won't be able to see me on it. But he laughed so hard when I told him that I fell in love with myself when I saw myself in the mirror with the Monalisa on, lol! We bought the dress last Saturday. I got lucky that there's one on my size in their warehouse so they are going to have it ready for me in 10 days. It needs to be altered because I'm so short for the gown but at least we have plenty of time to do that before I fly to the PI in November. 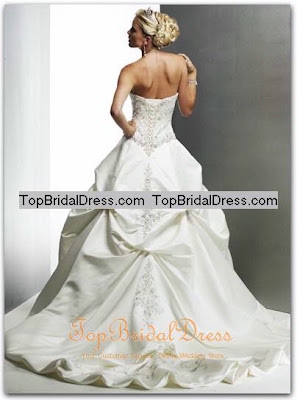 The website describes the gown as a one-piece, corset, strapless, full A-line gown with sweetheart neckline. The gown features regal embellished embroidery accented with Swarovski crystals, bugle beads, seed beads, glass beads, and sequins. Embellishments ornament the bodice and center front skirt panel. The caught-up cutaway skirt is richly decorated with motifs that also accent the caught up skirt back. The embellished chapel length train finishes the style. It is available in All White, White/Pewter accent, Ivory/Pewter accent. I got mine in Ivory/Pewter accent. Woohoo! I am so excited. I can't wait to actually wear it on my wedding day. Now, I'm gonna start to think about what accessories go best with it. I'm actually thinking of getting a set of 3-row pearl choker necklace and earrings. Instead of a tiara, I might wear an elegant but simple crystal headband. I'd like to have my hair down with little curls but I'm not sure if it will look good on me. We'll see. Awwww! I'd better stop rambling, hehehe! I'll share more photos about it as I am getting everything finalized. Oh, by the way, if you've read this far, thanks a lot for taking time to know more about me and our upcoming wedding. It's my pleasure to share this with you, guys! I have been pretty busy lately. I’ve visited 3 bridal shops to look for my ultimate wedding dress. I had my first ever branch visit to Springdale for work yesterday. I was scheduled to work for 4 hours today. Later this afternoon, we went to the last bridal shop and finally made our purchase for my dream wedding gown. I’ll talk about it more on a different post. Right now, I’m just exhausted. Furthermore, I’m kind of stressed out with getting this one more church requirement for our wedding. We can’t seem to get a hold of anybody on the phone and we’re uncertain of what’s the best way to get this recommendation from the church. This is the only requirement that we have not taken care of and it’s keeping us from formally booking our church. Weddings are truly stressful to the highest level, lol! Anyway, let me end this post so I can review the term life insurance quotes that I got on the mail. Hope you all had a wonderful weekend. 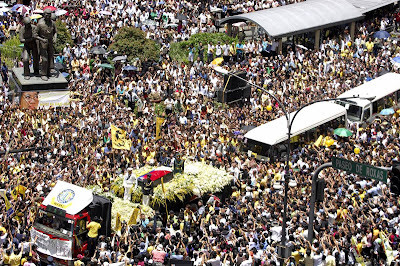 As of this writing, I am watching the last mass for Cory Aquino on T.V. I don't know her personally but I am deeply affected by her passing. I could not count how many times I've cried since she passed away. I'm sure millions of Filipinos feel the same way. As a matter of fact, the image above says it all. This was during the procession when her body from La Salle Gym was transferred to Manila Cathedral. Undoubtedly, she is dearly loved by the people in my country and we will forever be grateful for bringing back freedom to our country. We will miss you, Tita Cory! I must admit that I got nervous when my friend mentioned that the Philippine Consulate General in Chicago no longer accepts mailed-in applications for passports. Well, this part is true and I'm aware of it because it's clearly stated on their website. If you're renewing your passport or applying for the first time, personal appearance is required thus they won't accept applications through the mail. However, my passport is still good until year 2012, and I only need to have it amended as it still bears my maiden name, so mailed-in applications are still accepted. I was pretty sure of this until my friend asked me if it's really fine to do this. That's when I started to worry, lol! But there's nothing to worry anymore because today I got my passport back with my married name on it along with a copy of the report of marriage form with the civil registry number as proof that our marriage in the U.S. is also acknowledged there in the Philippines. Yay! Philippines is in mourning. The lady who had lead the country in taking back our freedom from the dictatorship of the Marcos regime succumbed to cancer on August 1st at the age of 76. I couldn't help but was moved to tears by the outpouring of love and sympathy from the Filipino people for the former President Corazon Aquino. They didn't mind waiting in line for long hours just to get a last glimpse of the late president at her wake. I was only 9 years old when People Power lead by Cory Aquino happened back in 1986 but I can vividly remember the images of armed military in uniform and the huge tanks that Marcos sent to scare the millions of Filipino people who came out to the streets of EDSA to oust Marcos from power. It was a bloodless revolution in the history of the world. That was made possible because of the brave leadership of a simple housewife who was always proud to be born a Filipino, our Madame President Cory Aquino. This lady had gone through a lot. Her husband Ninoy who was a Senator then, was murdered because the dictator thought of him as a threat to their evil scheme. But that didn't stop him from fulfilling his dreams to give us our freedom for his dear wife Cory continued the quest and was victorious. She may have gone to join our Creator, but she will always be remembered as a symbol of freedom and democracy. We will miss you, Madame Cory! May your soul rest in peace. Let me leave you with this inspiring excerpt from her speech before the U.S. Congress 7 months after she was proclaimed President of the Republic of the Philippines.